Alan Furst meets Alan Moore in the opening of an epic of supernatural alternate history, the tale of a twentieth century like ours and also profoundly different." As a big fan of Alan Furst the above was an important selling line for me, but I had not really expected the awesome novel that "Bitter Seeds" turned out to be. 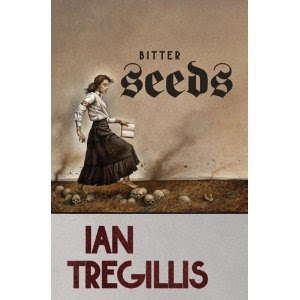 "Bitter Seeds" is the first novel in the Milkweed Tryptich and it has a superb cover to boot. FORMAT/CLASSIFICATION: "Bitter Seeds" stands at about 350 pages and is divided into fourteen numbered chapters that cover events from 1939 to 1941, plus a prologue taking place some decades earlier and an epilogue shortly after the main action ends. Each chapter follows several threads that feature at least one of the three main POV's: Marsh a British intelligence officer who was sort of adopted as a poor urchin by John Stephenson a WWI hero who later becomes a leader of the British secret service, Will a British noble, younger brother of a duke, warlock, college roommate and friend of Marsh and Klaus a German "superman" - "the ghost who can teleport through solid matter". The threads are marked by date and location. "Sold" as children to Herr Doktor von Westarp in the aftermath of WWI, Klaus and his sister Gretel - who becomes the most important of the "super-humans" of the Germans as her powerful precognition ability can literally mean life or death for people and victory or defeat for nations - are of gypsy origin in the racial Nazi society, but since the seemingly crazy experiments of von Westarp worked and produced several people with supernatural abilities, the Nazi leadership is less than fussy in looking at their racial origins. Of course what someone like Gretel with her ability to see the most probable future will do about that remains to be seen. Starting as an alt-history with some supernatural touches that does not diverge obviously from the known history until 1939, "Bitter Seeds" quickly accelerates the pace of events once the war begins and the fantastic elements take over the more we advance in the novel. "Bitter Seeds" ends at a reasonable point and the next installment became another top anticipated novel for me. ANALYSIS: "Bitter Seeds" grabbed me from the first pages that take place in the bitter aftermath of WWI: in a suitably isolated Gothic manor, Herr Dr. Von Westarp is "buying' unwanted children for nefarious purposes, while on the winning side, one armed former aviator John Stephenson currently of British Intelligence watches a pack of poor children trying to vandalize his garden to get some edible roots, when a ten year old urchin that later will become Captain Raybould Marsh catches his eye by his bravery and leadership abilities. Also in another isolated Gothic manor, an English Duke initiates his young grandson William in ancient family rites and secrets. Fast forward to 1939 and the action becomes non-stop following Marsh, Will, Klaus and Gretel in their various doings, so much so that "Bitter Seeds" was one of those novels I could not put down until I finished it and reread it immediately to get the subtler nuances I missed on my first read. There are lots of cool touches like "Milkweed" the British agency to combat/use supernatural and after which the series is called, while its creator John Stephenson recalls famous real life agent Intrepid, there are Red Orchestra agents in the picture, some Nazi chiefs have cameo appearances, but most of all "Bitter Seeds" shines in its characters about which we get to care a lot and in the style which is just superb. While the excerpt linked above will give you an idea about the style of the novel, I want to talk a bit about the four main characters. Marsh starts as the typical "secret agent" devoted to Crown and country, with a young pregnant wife to whom he wants to return from his dangerous missions. Will is the seemingly dissolute scion of privilege - but without responsibility as second son - who drunkenly slips once too many times in front of his friend Marsh about his "secret warlock powers", so when the German super-humans are sort of confirmed, the two are the natural first recruits in Stephenson's Milkweed. As the war escalates, the atrocities multiply and the price of staving imminent defeat and later maybe even moving toward victory increases, Marsh and Will are tested to the limit. There are lots of superb action scenes too, while a - Nazi "supermen" and their support troops against British warlocks and their special troops - direct fight is worth the price of admission by itself. Another great touch from "Bitter Seeds" is how the supernatural elements get more and more accentuated as the war escalates, since as all history teaches, once a weapon is invented -or discovered as here is the use of Eidolons' magic to combat the powerful German pressure - it gets refined and improved; nothing stays static and nowhere is that better shown than under the pressures of war, with "Bitter Seeds" taking this to the inevitable extremes. Based on writing quality and main characters "Bitter Seeds" (A++) is hands down the best debut of 2010 so far. It is also the one novel of 2010 I would recommend to anyone who believes that speculative fiction cannot compete with "literary" novels, while having a strong core-genre content. Don't get me wrong, I really like your Blog ... but could we please, pretty please stop giving every single book an "A" rating at the very least? Lately there seems to be a plague of "A++" ratings going round as well. I'd really love to use your blog for book recommendation, but alas, it's hard to respect a reviewer that seems to absolutely love every single book thrown his way. When we started reviewing more for FBC we had stated countless times that we were going to review books we thought we'd like and not force books that we know we don't like. I don't think it's wrong to showcase books that a reviewer loves instead of ones that he hates? Why waste the time on a book that a reviewer won't like? We don't get paid for this so forcing ourselves to read books that we won't like and therefor giving it a bad review just isn't what seems a good use of our time. There are so many good books out there that to waste it on a bad book doesn't seem practical. There are plenty of blogs out there. If you are unhappy with the review style you are welcome to go else where. This sounds great! WWII, warlocks and nazi supermen? You have sold a hardcover to me, for sure. This somehow also reminds me a bit of The Rocketeer, which I also love dearly. Thanks for the review, Liviu. No need to show me the door just yet ... I enjoy reading recommendations, and there's quite a few jewels I've discovered thanks to FBC. And of course I understand that you generally pick the books you like; it'd be kind of strange if you wouldn't. But to be honest, it's hard to believe you guys are loving every single aspect of every single book you're reading. And that every single book you're reading is a masterpiece (if that's what a rating of A++ is supposed to mean). That is a valid point you bring up, however if you see Liviu's past reviews they often have a variety of positive or negative reviews. I'm relatively new to this, but I trust Liviu's judgment and if he does really like a book, he's going to say so. if not then he's going to say that too. Another reason for this happening, could be the fact that Liviu might be reading a lot of good books recently and hence it reflects in the reviews, that could also be the case don't you feel so? Anyways Heretik in the end, the decision is completely yours. Have a good day mate. It's a bit unfortunate that I chose to vent in this particular review, having of course not read this book yet (though it sound very promising and is on my wishlist). Everyone needs to vent once in a while or we'd all be walking around like hot airballons waiting to explode! I agree with Heretik's gripe in principle. Moving on. This books sounds awesome. I just got it from the library. I think it's every reviewers style. I don't trash a book but have no problem writing negative reviews. Liviu's reviews are of course no reflection of EVERY review on this site. There is a point but to group the whole site and blog in one was a bit extreme there are plenty of reviewers here with varying opinions and review styles. Just finished the book and thought it was great. I was a little wary when I started because I just came off reading a couple of non-fiction WWII novels. I was feeling a little nit-picky but in the end I really enjoyed "Bitter Seeds." I have since found out that this is the first in a series and I'm excited to get my hands on the next book.